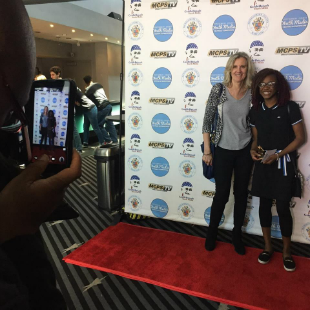 P4L students rocked it on Saturday, April 28th at the Montgomery County Youth Media Festival. There were 6 short film finalists in the middle school competition and three of them were P4L student teams (from Silver Spring Int'l MS, Eastern MS and Loiederman MS). First prize was won by two of our GRRL Tech girls from Loiederman Middle School: Mayeni and Momo. They produced a powerful documentary film called "Beauty is in the Bleach" about skin bleaching in Nigeria to meet beauty standards, influenced by its colonialist past. Marian Conteh,Ebonie Gadson and Isabella Louis are P4L alums who are now in college. Over the summer they worked alongside our summer camp instructors and coached middle schoolers at technology and Go2College camps. They were an inspiration! 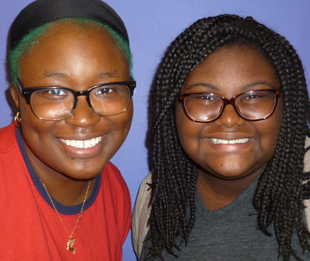 Marian and Ebonie attend Montgomery College and will transfer to four year universities in the Spring of 2018. Isabella is a senior at Goucher College and will graduate in May 2018. In early 2016,P4L alumna and Montgomery Blair High School senior class president, Yuchabel Sanon, participated in for the First Lady's Mentoring Program. Each Wednesday for several months, she engaged in activities with her official mentor, the First Lady's official photographer. Yuchabel went to the White House Christmas party, the Easter Egg Roll and to Camp David. She's learned how to unleash her enormous potential! In the Spring of 2017, Yuchabel was honored and awarded with a $10,000 college scholarship at the Children's Defense Fund "Beat the Odds Gala" in Washington, DC. 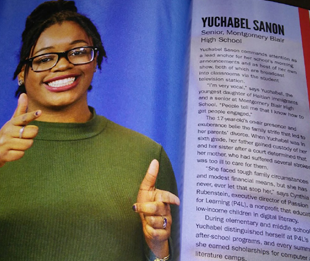 Also in the Spring of 2017, Yuchabel was selected and featured in Bethesda Magazine as one of Montgomery County's Top Teens! Yuchabel is now a freshman at Towson University. This young woman is going places!